Contact person: Dr. Ulrika Möller, phone +46 (0)31 786 5937. Personal web page. Ulrika Möller is involved in research focusing on international relations theory and foreign policy analysis. She has studied global policy issues of interest including nuclear weapons control, and fishery management. Her research interest also includes Indian society and politics. On Friday 21 September 2007, Ulrika Möller defended her doctoral dissertation titled ”The Prospects of Security Cooperation: A Matter of Relative Gains or Recognition? India and Nuclear Weapons Control”. The faculty opponent was Professor Ian Clark from University of Wales in Aberystwyth.The thesis adresses the problem of state defection from multilateral cooperation, with empirical focus on India’s decision to repudiate the Comprehensive Test Ban Treaty (CTBT) in 1996. Theoretically, the thesis develops an explanation to state defection which contradicts the commonly held view, launched by structural realism, of international politics as a self help system. More information about the dissertation (only in Swedish) . She is now working on a new project related to nuclear weapons control in Iran, titled ”Nuclear Weapons, International Norms and States’ Motives: A Study of Iran’s Nuclear Ambitions”. It is funded by a grant given by the Swedish Institute of International Affairs (UI) in late 2007. Ulrika Möller is also involved in a new research project in the department, focusing on political leadership and democratization in Asia and Africa, with case studies dealing with the situation in India and Pakistan. The project, coordinated by Dr. Isabell Schierenbeck, is titled ”The Road to Democracy: Exploring the Impact of Leadership Guidance”. In October 2007, this project was granted SEK 2.4 million by the Swedish Research Council as a three-years grant (2008-10). More information about the 2007 Swedish Research Council grants. Abstract: This research-project addresses the problem of democratization through a focus on political leadership. In addition, the project is guided by the presumption that history contains important insights for how democracy can be reached, preserved and enhanced also today. In order to illustrate our point of view, India is a useful example. After almost 60 years as a sovereign state, India is currently described as a “mature democracy”. Considering the intentions among the early political leadership – most notably Mohandas Gandhi and Jawaharlal Nehru – when India gained independence (in August 1947), this is only to be expected. 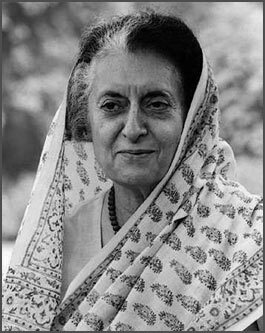 However, if one takes into account the Emergency Act, proclaimed by Prime Minister Indira Gandhi (photo to the right) in June 1975, the current democratic quality of the Indian society looks less self-evident. The emergency regime, carried out for over 18 months, involved authoritarian practices such as removal of parliament influence, imprisonment of opposition, press censorship and family-planning through forcible vasectomies. Nevertheless, in January 1977, Prime Minister Gandhi announced that free election should yet again be held, and gradually, the Indian society re-gained democracy. This illustration is useful in the sense that it illuminates that some states (like India) manage to defeat obstacles to democracy, which leads to the question that guides this project: What values and strategies of a political leadership facilitate the road to democracy, and reward their societies with a resilient democracy? Dr. Möller is otherwise working on projects not specifically related to South Asia. A reseach project, “Navigating towards efficient fishery management“, adresses the problem of appropriators’ compliance with institutional regulations, and a second research project, “Beyond Neutrality?“, explores the impact of the EU-membership on the security policy in Sweden, Finland and Austria. She is also teaching in the department, topics such as international relations theory, global governance, environmental security and the EU as a global actor. PhD Candidate Aiysha Varraich is working on a project entitled ”Power in the Hands of Saints”? Aksel Sundström is a student of Political Science who wrote an interesting Minor Field Studies thesis on elected women’s participation in Indian local governance at the department in the Spring 2008. His thesis is titled ”Leaving the ‘proxy woman or politician’ dichotomy: A qualitative study of the possibilities and obstacles for elected women’s participation in Indian local governance”. It focuses on the discrepancy between formal and effective power of elected women. By studying perceptions of female representatives in local governance in the Indian state of Bihar he aims to develop a more nuanced theoretical view on the possibilities and obstacles for effective use of power of elected women in a context of low economic development. The main result of this study is presented in a mapping of perceptions of elected women on their possibilities and obstacles for effective use of power. Another main result is that supporting possibilities for elected women should be seen as derived from the same context as hindering obstacles. The coexistence of obstacles and possibilities for elected women in a context of low economic development is an argument against the dualistic theoretical view that tends to picture the elected women either as “proxy women” or as empowered politicians. With this more nuanced analysis of the possibilities and obstacles for elected women an understanding of their scope for effective use of power can be given. Read the full thesis.